When a lot of new students start classes here (and even some upperclassmen), they don’t always know about the weekly farmers’ market uptown. While your swipey isn’t a payment option at this particular market, it is worth checking out. You can personally talk with the person who harvested your lettuce, strawberries, or whatever else is in season at the time you attend. There are also stands at the market that sell coffee and the most delicious muffins—almost as good as Miami’s homemade muffins. I personally enjoy picking up fresh produce at the farmers’ market, then heading to MacCracken for local pasta and dessert options. A trip to these two markets can help support a healthy diet and give back to the community around Miami as well as the Miami community. The Demske Culinary Support Center (DCSC), previously the building that housed Kroger, today is where all food for the Oxford campus of Miami is prepared. Why is it so cool to have our own culinary support center? Not every school has one and because we do, we have control over our menus and can even hire students to do jobs that other schools hire out to contractors. 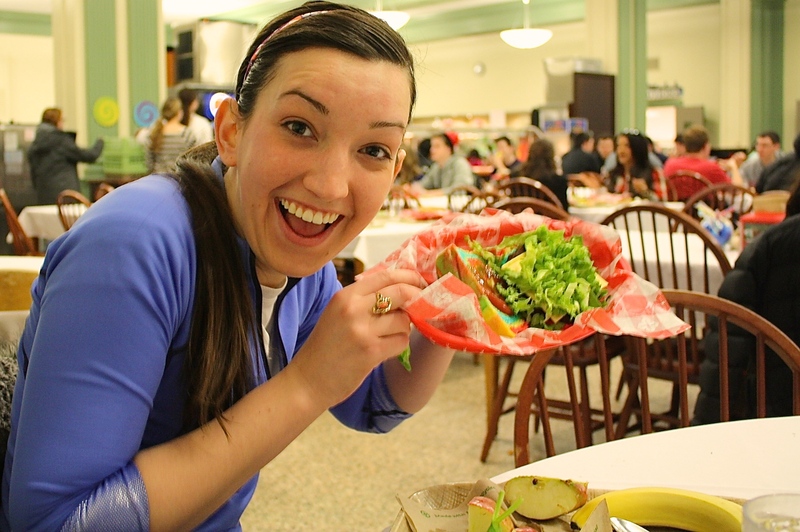 $1.5 million of the campus’s food budget is spent on fresh produce. Over 1 Million pounds of fresh produce are chopped/sliced/diced/shredded on an annual basis. The Demske Culinary Support Center, houses, washes, processes, and ships food to the campus six days a week, Monday-Saturday. That’s 300,000 heads of lettuce; 70,000 cantaloupes; 35,000 honeydew; 50,000 broccoli crowns; 24,000 heads of cauliflower; 400,000 pounds of peppers; 50,000 baking potatoes; 80,000 oranges; 125,000 apples; 275,000 bananas; 30,000 pears; and 200, 000 grapefruit. All of the fruits and vegetables that are shipped as is from the center are washed and shipped in reusable shipping totes! So green! That’s some food for thought. 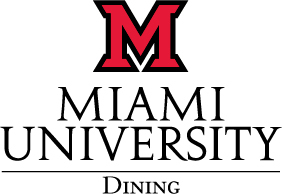 There is a huge advantage to a university that has an in-house processing and planning facility for campus dining (The Demske Culinary Support Center). Decisions can be made faster and easier, sustainability can be more easily achieved, and overproduction can be better controlled. Because a quarter of food supplies are purchased locally, less resources are used to transport the food, and the surrounding community benefits from this practice also. Another practice utilized at the culinary support center is batch cooking. Batch cooking is a method in which the customer demand dictates the amount of product being produced at any given time. Also, the ordering time for next day processed produce, deli meats, sliced cheeses, and packaged salads and sandwiches has been reduced to less than a 12 hour window for next day delivery. This allows the unit managers to very accurately order the exact amount of product needed for that day’s service, thus reducing overproduction and waste. When possible, the department donates products to two local food banks that help to feed those in need. In 2012, we, at the Demske Culinary Support Center, exchanged our trash compactors for organic matter compactors. Today we divert over 400,000 pounds of scrap from landfill to compost facility. Housing, Dining, Recreation & Business Services is audited by the sustainability office on waste control to ensure that all available options are being explored on waste prevention. You can do your part too! Don’t forget to recycle today!! Also, tours are easily available and encouraged. Call 513-529-3040 to schedule. -The napkins used in dining operations are 100% post-consumer recycled product. -The packaging choices for to-go and centrally packaged products now include lines of bamboo, sugar cane, corn starch, or recycled paper products. -Most dining units use the compactor trash units to press waste into the smallest space possible. -All plastic and metal is recycled through the Miami sorting facility. -Products delivered from Demske Culinary Support Center to units are sent in reusable plastic totes or carriers that generate no waste. 26% of all food served on campus is grown/produced within Ohio. That’s over a quarter of the food. Woot-woot, local! We work with eight local farmers to purchase as much fresh produce as possible. Watermelon, apples, broccoli, peppers are just a few examples. All deli meats—ham, turkey, smoked turkey, salami, chicken and roast beef—as well as natural cheeses—Swiss, Colby-jack, pepper jack, Provolone—are produced in Ohio. During an average year, there are 9,000 pounds of these products sliced, packaged, and distributed each week! Woah. Annually, over 10,000 gallons of locally produced ice cream is used in milkshakes at Encounter, Miami Ice, and Pulley Diner. Miami Ice and Pulley Diner both use Young’s Dairy. Also, Dan Young is Miami Alum. Richard Graeter (of Graeter’s Ice Cream) is Miami Alum and pints of his ice cream are sold at most market locations. Local food means less fuel costs, less pollution, fresher foods, and jobs given to local people.